Ahead of launching the book ‘In our Hands: a History of Community Business’ 6.30pm tonight at the Locality Convention. 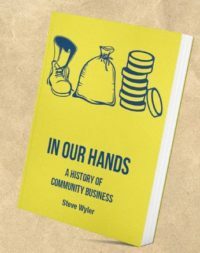 Author Steve Wyler reflects on the role history plays for community businesses today. One Friday afternoon, about fifteen years ago, I had a visit from a Japanese professor. There was nothing particularly unusual about that. I was working for the Development Trusts Association, the forerunner of Locality, and we had frequent visits from Japanese academics, sometimes coach loads at a time. We used to tell them about our member organisations, community businesses across the country doing amazing things, and they would listen politely, thank us profusely, and we would never hear from them again. A few days later, I was in a meeting with a group of people who were setting up the Social Enterprise Coalition, which is now Social Enterprise UK. The discussion turned to the term ‘social enterprise’ and where it came from. ‘I think I was the first person to use the term,’ said someone, rather smugly, ‘back in 1992.’ ‘Actually, it must have been me,’ said another, ‘I came up with the words in 1987’. And so it went on, right round the table, everyone claiming to be the inventor of social enterprise. I wonder how far it really goes back, I thought, thinking about Yasuo Nishiyama’s mind map. Years later I discovered an article about leadership in social enterprises, which included the sentence: ‘should one wish to destroy a social enterprise, it could not be done more effectually than by aiding it in the appointment of a leader unfit for the office.’ How true, I thought. The article was published on March 15th 1877. Does our history matter? Yes I think it does. The strength and endurance of the community business movement is not simply about breadth and scale in the here and now. We also have depth and scale in the past. With support from Power to Change, I have been able to explore the early origins of community business in the medieval guilds, in seventeenth century radicalism, in friendly societies and early co-operatives. I have seen how, generation after generation, people have turned to community business. Whether in response to the social evils of Victorian industrialisation, the poverty of the Great Depression, or the failures of modern capitalism and the welfare state. This, it seems to me, is a big story, but one which has been too often forgotten. Or rather, it is a collection of many stories: Margaret Woodhouse and the Moravians in Pudsey in the 1760s; the Union Mill societies and the first community share issues in the 1790s; Josiah Warren and the first time bank in the 1820s; Robert Owen’s National Equitable Labour Exchange in the 1830s; Feargus O’Connor and the Chartists in the 1840s; the Brynmawr Experiment in the 1930s; John Pearce and the flowering of community business in Scotland in the 1980s; the first community pubs, also in the 1980s. And so on. And that in the end is the gift of our history. It can make the heart larger, and in doing so, I believe it can give us the confidence to imagine and to act, and perhaps to shape a more hopeful future. community-led organisations. He is co-founder of A Better Way and a panel member of the inquiry into the future of civil society. 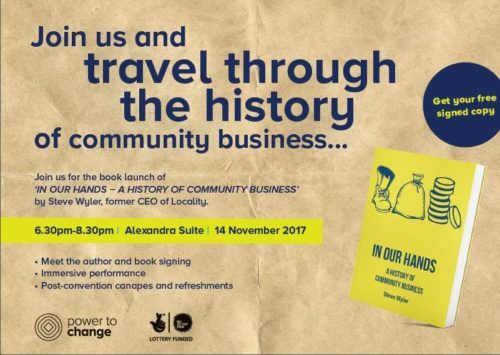 His new book ‘In our hands: a history of community business’ will be launched at the Locality convention in Manchester on 14 November 2017. Throughout the launch we’ll be tweeting with the hashtag #CBHistory. Join the conversation and let us know what you think.